Flicker Alley is proud to present the following essay by Mary Mallory. Mary Mallory is a photograph archivist, historian and the co-author of the recent books Hollywood Celebrates the Holidays and Hollywoodland. She blogs on Los Angeles and film history for the LA Daily Mirror. 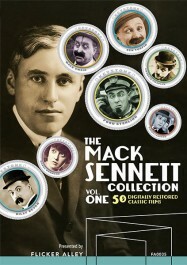 Comedy legend Mack Sennett popularized slapstick comedy in moving pictures with his knockabout Keystone Kops. He introduced such great talents as Charlie Chaplin, Harry Langdon and Carole Lombard to film screens, while nurturing and refining the comic skills of icons Mabel Normand and Roscoe “Fatty” Arbuckle. Through blind chance, Sennett’s participation in two great Los Angeles real estate developments both publicized and legitimized them to the American public. A temporary billboard composed of individual letters 50 feet high and 30 feet wide painted white and constructed from telephone poles, pipes, sheet metal, and chicken wire spelled out the word “Hollywoodland,” a massive advertisement beckoning home buyers. When illuminated at night, the impressive sign was supposedly visible all the way to Catalina Island, 26 miles away. Besides the giant billboard, developers smartly employed virtually every type of media to market the subdivision. Thanks to Chandler’s involvement, Hollywoodland received a plethora of free advertising through both articles and photographs in the Los Angeles Times. Lavish rotogravure brochures, radio broadcasts and even motion picture newsreels publicized the venture. Attracted by Hollywoodland’s beauty and exclusivity, movie mogul and real estate investor Sennett joined forces with developers in 1925 in an unofficial quid pro quo, gaining 18 valuable acres to construct a fabulous mansion in return for advertising the development. Sennett’s bathing beauties posed atop steam shovels, touring cars, and even with traffic signs for images disseminated to the press. The comedy king hired Hollywoodland architect John L. DeLario to draw up plans for an estate to rival Pickfair and Greenacres as Hollywood’s grandest hacienda. DeLario designed a spectacular Mediterranean mansion to be located atop what is now called Mount Lee above and behind the Hollywoodland sign, visible to both the San Fernando Valley and the city of Los Angeles. Rumored to cost anywhere from $250,000 to $1 million and modeled after villas in Italy’s Lake Como District, the gorgeous estate’s grounds would contain gardens, terraces, patios, statuary, loggia, fountain, outdoor amphitheatre, miniature golf course, tennis court, and a 40 by 75 foot swimming pool with sand beach. Inside the home, loggias, patios, cloister, living room, dining room, conservatory, library, drawing room, kitchen, guest suites, and two master suites loaded with amenities. 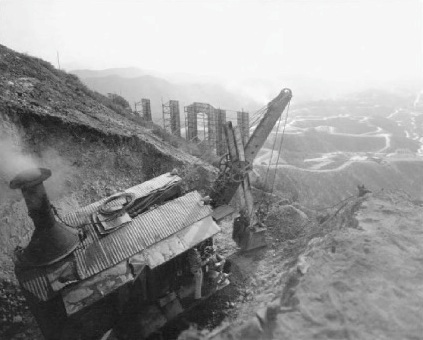 Developers spent months constructing a switchback road from Mulholland Highway up to the crest of the mountain, the only element ever completed toward Sennett’s mansion. In early 1926, Sennett handed over the property to the development, abandoning his interest in the site. 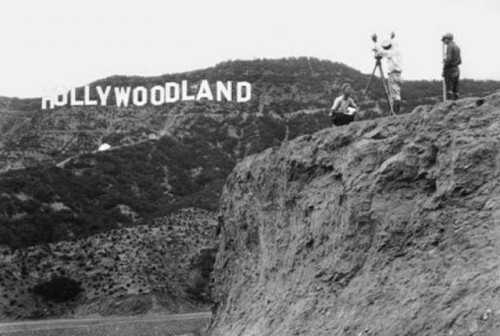 Though Sennett never erected a home in Hollywoodland, his use of the area for location filming, for shooting striking publicity photographs, for filming newsreels and for devising nice press hooks provided much needed free advertising throughout the world. Without Sennett’s free publicity, Hollywoodland might not have become as popular with potential buyers around the United States. 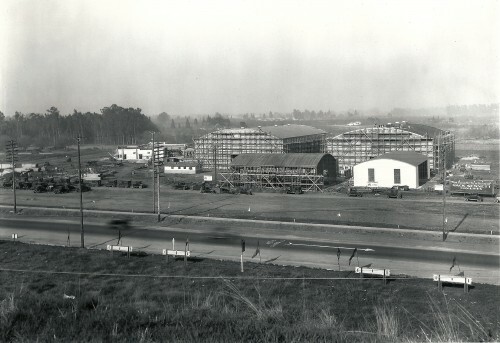 Just a few years later, construction of the new Mack Sennett Studios in an area of North Hollywood adjacent to the Los Angeles River would give the community its name. As with Hollywoodland, Sennett received some quid pro quo, obtaining acreage at a very cut-rate price from the Central Motion Picture District syndicate on which to construct his new studio. He recounted in his autobiography, Father Goose, that “a group of enterprising real estate operators in the San Fernando Valley… offered me a gift of 20 acres of land near the trickle known as the Los Angeles River” on which to build a studio. Harry Merrick, formerly president of the Chicago Association of Commerce, headed the real estate syndicate composed of such people as B.P. Schulberg, B.P. Fineman, Milton E. Hoffman, Hector Turnbull, Roy Pomeroy, Noah Beery and banker Gilbert H. Beesmyer. They intended to turn the land between Ventura Boulevard, Radford Avenue and the Los Angeles River into a huge motion picture production district filled with studios, post production houses and ancillary businesses, and land from Tujunga Avenue to Tacoma Avenue (now Laurel Canyon Boulevard) to Ventura Boulevard to Chandler Way as the residential district in which employees of the surrounding entertainment industry would live. Newspapers announced on June 11, 1927 that the Mack Sennett Studio would arise on Central Motion Picture District land, composed of 12 buildings in the California Renaissance design by architect Harold Cass. To make way for construction, bathing beauties, studio staff and other workers began picking fruit from the 275 acres of plum, peach, and apricot orchards that would soon be destroyed. Later, 60 acres of walnuts, five acres of pecans and 25 acres of grapevines would be harvested before they too would be plowed under. While construction was underway on the studio, the syndicate began building three public schools in the area. The Pacific Electric Railway later introduced service between Universal City and the studio center as well. On March 18, 1928, Mack Sennett Studio held its grand opening gala introducing its new $800,000 studio to the world, concluding with the baking of the world’s largest pie at the time. Filming officially began at the new lot May 1, 1928. Because so many people drove down Ventura Boulevard viewing construction of the Sennett Studio, the United States Post Office called the local facility the Studio City Post Office when it opened later in 1928, thereby giving the community its name. The Los Angeles Times reported in July 1928 that approximately 21,000 automobiles drove past Ventura Boulevard/Radford Avenue on a typical Sunday, making it the city’s third-busiest traffic intersection. 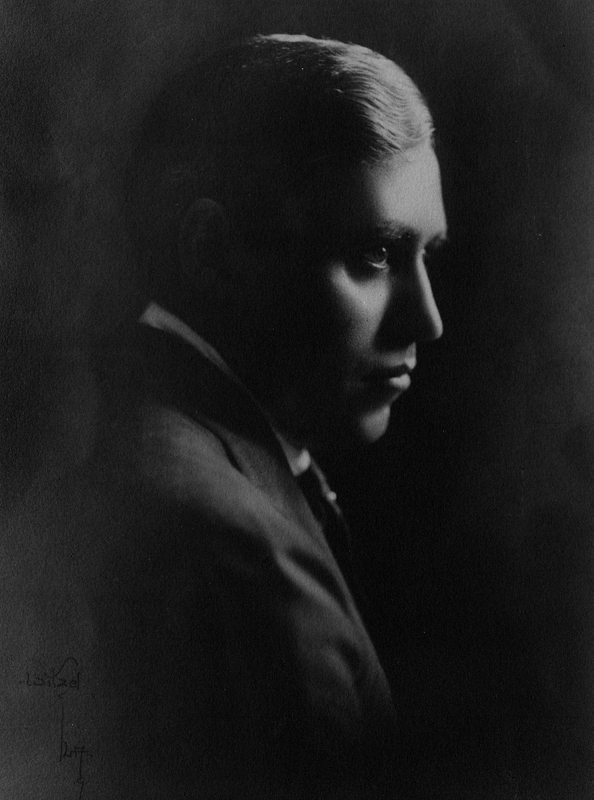 Mack Sennett’s participation in the Hollywoodland and Central Motion Picture District development efforts provided much needed free publicity in newspapers, magazines and newsreels, spreading the word about the projects to the world and giving the community of Studio City its name. 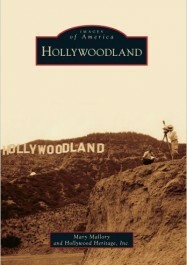 My book, Hollywoodland, for which all profits are donated to the historic preservation organization Hollywood Heritage, documents the history of the remarkable neighborhood and its world famous sign. It is available through Arcadia Publishing, the Hollywood Heritage Museum or a bookstore near you.